I don’t think I love teaching anymore. There are loads of initiatives being dumped on us and who I once was as a teacher is lost. What do I do? A handful of years ago I found myself at the end of the school year, getting ready to have my usual last day with seniors. Off-handedly, I planned a “last day” that turned into a tradition where I’d go around the room and tell every senior something I was going to miss about them. The night before the last day, which had easily become one of our most special days, was suddenly the night before the day I realized I’d lost my way. As I sat there with class lists in front of me, I sadly realized I hadn’t learned these people. Due to some state and local initiatives, namely standards work, I had become so focused on articulating and unpacking, assessing and validating, that I had confused teaching with apparatus. Yes, I could show evidence of their demonstrated skills, but I struggled to come up with what I would miss most about them. I went back and looked at papers some of them had written, projects they had completed. Along with all those perfectly organized rows and columns of checked-off rubrics I had so carefully focused on were the real stories of angsty teenagers and emerging voices, of struggling writers and careful readers. And I had missed it. If you have lost yourself and want to be found, go back to your beginning and see if the path is still there. It’s an exercise in memory. Go back before the heaviness, before the initiatives, before the reporting and before the grids. Go back before the voices that dissent and the ones that criticize, the voices that misunderstand and the ones that ask you to hold their frustrations. Go back until you remember what it’s like to get that little spark that starts in your stomach when you come to the door of a school. Go back until you remember what it felt like the first time a student “got it” and the smile that came across her face and then yours. Go back until you remember why you wanted to become a teacher and what it felt like to be pulled to this profession. Go back to the beginning and see if you can still find yourself there. If you can, then do one small thing today that feels most true to you. See what happens if you start class with a poem or a story that makes you all laugh. Instead of leading with the science of teaching, lead with the heart of it. Open a conversation with a student, pause a little longer when you look at their work to see past answers and into a learner. Then do it the next day. And the next. I know this doesn’t take away the initiatives that weigh on us all. But it can humanize them. It may help you put them in perspective. And if after this, if it’s still not right and you’ve lost your way, then without guilt or judgment, make a change. Just because you leave this classroom doesn’t mean you’ll stop being a teacher. Remember, this very real struggle isn’t about one or the other: initiatives or humanness. It’s about merging the best of both into an experience where every student has the opportunity to flourish in many ways. 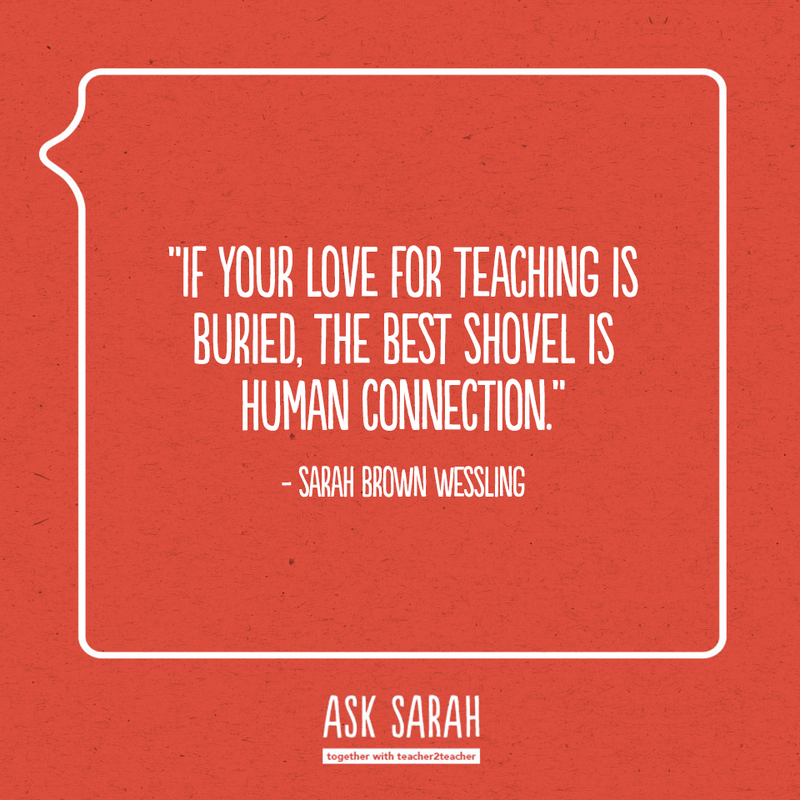 But, if your love for teaching is buried, the best shovel is human connection. I haven’t lossed my love for teaching children, rather I have lost ability to balance the amount of work and my personal life. I am not sure if this career is for me any longer because as it is, I can’t begin a family with all the work and stress that comes with the job. I am a great teacher, but each lesson requires too much of my energy.